Multiple members of Square Enix's development teams want to see a Final Fantasy VII title on the 3DS. Final Fantasy VII might not be remade on the 3DS anytime soon, or elsewhere for that matter, but one of its spin-offs might if wishes at Square Enix come true. Square Enix's Hajime Tabata, director of The 3rd Birthday and Final Fantasy Agito XIII, recently exposed his strong desire to see Final Fantasy VII: Before Crisis come to Nintendo's 3D handheld set to launch in 2011. The remake sounds like it'd be a totally new game, if Tabata gets a chance to create it. He wrote on Twitter: "If I were to make something for 3DS, I suppose it would be a remake of Final Fantasy VII: Before Crisis. I'd redo the scenario structure and game design for the 3DS. I think I'd like to make an action RPG BCFF7 where a large number of Turks players play simultaneously." Before Crisis is a cellphone game boasting 25 episodes once announced for North America, but these plans were seemingly canceled and it was never released outside of Japan. 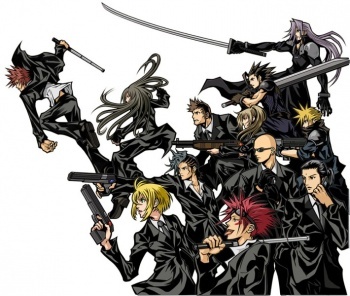 The game takes place six years before Final Fantasy VII and swaps who's good with who's bad by putting players in the shoes of the Shinra Corporation's Turks (the guys in suits). The Turks face a much more violent Avalanche rebel group, only just beginning and not yet headed by Final Fantasy VII's Barrett, which has popped up to stop the spread of a newly powerful Shinra. The spin-off is a real-time action-RPG where players complete missions in various modes to gain experience points and find weapons and armor. Materia is collected by taking a picture with the cellphone's camera, which is analyzed to determine the type of magic the materia will provide. A blue photo would provide cure, for example. Tabata also said that Square Enix's Tetsuya Nomura and Yoshinori Kitase, two other big names that have produced and designed many popular titles such as Final Fantasy XIII and Kingdom Hearts, want to see Before Crisis on the 3DS if possible too. The problem is that Tabata only labels the remake as an "ambition," because he and others are too busy working on titles such as 3rd Birthday and Agito for the PSP at the moment, while Tabata plans to work on an HD project next. Seeing as how nobody outside of Japan got their hands on Before Crisis, it'd be nice to see it come to North America and Europe as a 3DS title. Plus, it'll be more Final Fantasy VII, and who doesn't want that?